Core Overload is a fast-paced top down shoot ’em up with deep customization, built in UDK from the ground-up to be focused on networked (online) multiplayer. 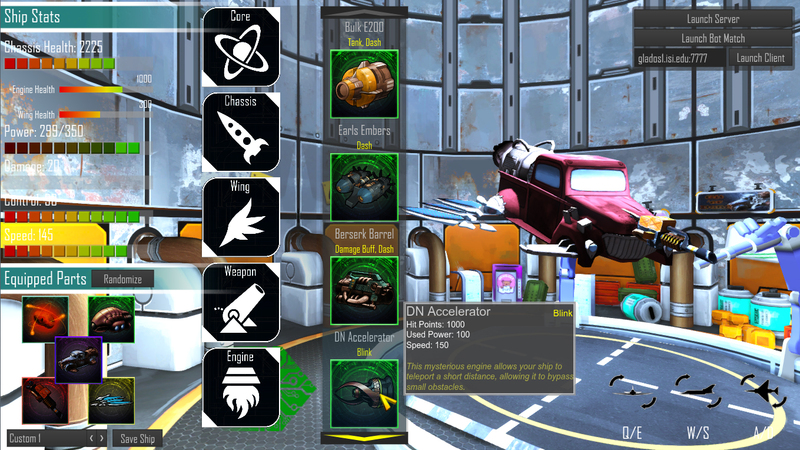 Players are able to build their ships using different combinations of wings, engines, chassis, weapons, and cores. An ambitious endeavour for a group of students, Core Overload was one of the game selected for the 2012-2013 USC final games year. Core Overload was one of those wonderful coincidences in life for me. The project was selected around early May 2012 to be part of the Advanced Games Project or “Final Games” class at USC. The class is typically taken by Seniors in my program, and is the “studio class” to rule them all. Two full semesters with a team anywhere from 15 to 50 students to make a game that nearly rivals AAA in scale and quality. To get a game made in Final Games, a student who wishes to be a “team lead” first must submit a “Pitch Document” with the design for the game. About 20-30 of these are received by a panel of professors and industry professionals who choose the top 10-15 to give a full pitch. Those 10-15 teams stand in front of a similar panel and present their game designs along with any concept art or live demos they have created. From there, 7-8 teams are selected to make their games the following year. Through this whole process and for the summer following, a team must be recruited by the students making the game. Students in the class are the primary picks for design and engineering, but other students at USC or neighboring schools are equally viable options, as are talented hobbyists online, especially for 2D and 3D game artist positions. Like many students, I attended the pitches to consider what team I might like to join. Afterwards, I had more or less set my sights on one project or none at all. It seemed to me the most technically challenging (a multiplayer game to be written in C++), and very closely mirrored a game I had once dreamed up myself. The announcements came out, and the game hadn’t made the cut. That game was selected as the backup, in case the class had more students than the professors had expected. At that point, I more or less gave up the chase, as none of the other games had appealed to me. A week or so later though, a recruiting email from the Core Overload team circulated. Again, I more or less dismissed it, until a friend of mine forwarded it back to me, pointing out that they were looking for engineering students to tackle the multiplayer component of the game. I hadn’t even noticed this before, but it kind of changed attitude, so I sent the team an email expressing my interest. They replied, asking me to meet them for an interview right in the heart of my final exams. I agreed anyways and again it left my mind. The day rolled around, and about 15 minutes beforehand, a calendar reminder goes off (these calendar reminders essentially run my days) to tell me about the meeting. With no time, I printed up a generic, overly verbose, 2-page version of my resume with everything I’ve ever done – completely taboo in games. I grabbed the warm papers off the printer, hopped into my flip-flops and biked to campus for the meeting (an all-too-common experience during my time at USC). Huffing and puffing, I popped through the door just barely on time and sat down to shoot through the generic behavioral questions from the team lead. As the lead engineer and another tech-dude started asking me about my resume, I began unloading all the projects I’d ever worked on to them. I handed them a running game on my Android phone, talked about apps I’d made, and discussed my past work experience all at once. With one awkwardly juggling information and devices, the other started lobbing first-round level technical questions at me. I brushed them off easily, as they seemed to come directly from the slides of my first-year Data Structures class (sometimes it pays to be a little younger and a little closer to that information). The interviewers seemed pleased and they actually ran out of questions after I answered their (equally easy) whiteboard question in about 30 seconds. I walked out of the room on clouds. Killing an interview is a great feeling, even when it’s just a bunch of kids barely older than yourself doing the interviewing. The email I received afterwards was icing on the cake – they were very impressed with my skills and offered me the position of Lead Network Engineer. With around 15 programmers, they wanted a dedicated strike team to address multiplayer, as it was easily the most risky component of the game for students (most of whom had not touched real networked code before). Further research (a.k.a. stalking) revealed that my networking team consisted of two very talented 2nd-year graduate students. While I anticipated some awkwardness there, being younger than both of them, I accepted the offer with lots of excitement. 4 months and hundreds of tireless hours later, we presented the game for the first time at Fall Demo Day – a student game expo turned recruiting fair with a hundred industry professionals and students of all kinds playing our games. Core Overload got amazingly positive feedback from students, professionals, and professors alike. All the “good press” internally set us up for all kinds of goodness in the following semester – a demo at Intel’s GDC booth, an invitation to special dinners with the dean’s of our program, and a tour of the Riot Games studio. When we presented the game at Spring Demo Day, we had a live 3v3 match between our team members, shout-casted by two of our developers. We wowed the audience with a freshly polished Ship Editor where players could create tens of thousands of ship combinations and swap them out mid-battle to adjust to enemy tactics. I think the most important thing about Core Overload was working with the team. I really enjoyed all the people on that project, and it made it really easy to put in the necessary time. I talked frequently with the leads and became friends with David, Emory, and Arnold. We all had great times traveling to GDC, drinking “Hop Overload IPA,” our very own beer brewed by one of the engineers. Time and time again I realize that this is the real draw to the game industry – working with fun-loving people who really care about their craft.